Problem: The interior foundation at the northwest corner of the building had settled more than 3 1⁄2” at the lowest point. It appeared as though the nearby trees were absorbing the moisture out of the soil causing the soil to shrink and the foundation to settle. The perimeter of the foundation was supported by bell-bottom piers. Factors for Consideration: Boxer Property needed to lift the settled concrete in order to begin building out the suite for a new tenant that was moving in the following week. As such, a solution was sought that would not interrupt their business flow. 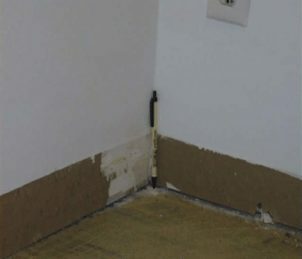 Second, there was no desire to completely replace the concrete because of the time, cost, and disruption to the other tenants. In short, something was needed to solve the sinking, unstable concrete that would not disrupt the normal everyday commerce at the building. Method/Process Applied: This unique process (The URETEK Method®) relies on a two-part polymer system, injected directly beneath the concrete through pre-drilled holes of 5/8-inch diameter (penny-size). The polymerization between the soil and the slab yields a co-efficient of expansion of 20 to 1, and a lifting capacity of 8,000 pounds per square foot. Result: The void fill, lift & stabilization was performed with the assistance of zip levels to accurately lift the settled concrete. URETEK ICR utilized the method and void filled and lifted the settled concrete in less than 4 hours with minimal business interruption. The material and process successfully brought the settling foundation back into more level plane. This, in turn, saved Boxer Property money in two ways: no need for expensive concrete replacement; and, no disruption to their business and customers. Boxer Property also was able to begin generating revenue by leasing out the suite the next week as a result of the URETEK Method®. Benefit: The settled interior foundation was eliminated, a costly full-scale repair was averted, the commercial building was back to business as usual. 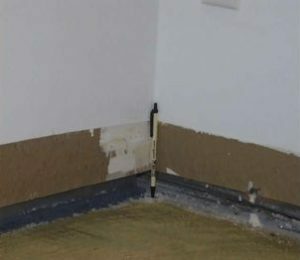 An additional benefit is that the URETEK 486 material used in the job has strengthened the underlying soil surface which will diminish any future foundation movement. The polyurethane is inert to mildew and fungi and will not mold or decay. In addition, it will not nourish insects or the root systems of the nearby trees.